Kayaking is an exciting sport that tests strength, patience and your sense of adventure. The size and shape of your kayak will vary depending on what water you’re on, but in this case, because you’ll be kayaking on Lake Tahoe and the Truckee River, go for a wider boat that allows you to sit on top of it. If you decide to go for a dip once you get to the middle of the lake, or if you get flipped out onto the Truckee, wider boats are easier to get back in and out of. Kayaking is a great way to explore the rivers and lakes around Reno Tahoe. 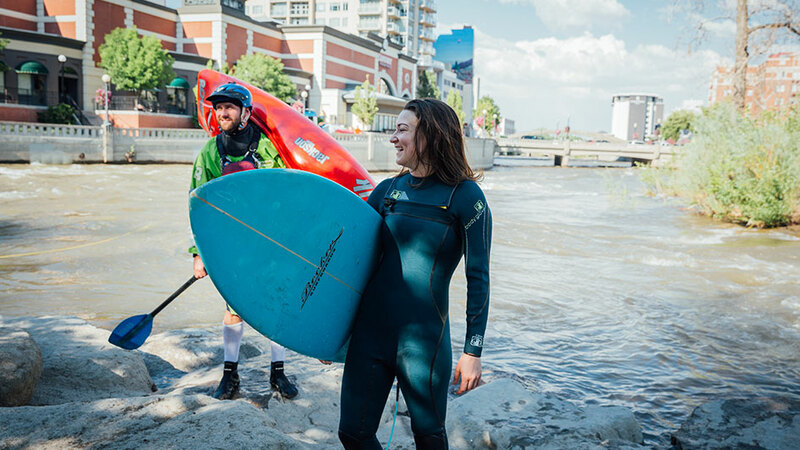 Take a peaceful paddle along the shoreline of a mountain lake or experience an adrenaline rush in the Truckee River Whitewater Park in downtown Reno. Depending on your skill level, you may want to take lessons or be part of a guided tour. If you’re more experienced on the water, you can rent a kayak and explore at your own pace. Whatever you choose, there’s something for every type of adventure-seeker. The Truckee River Whitewater Park is in the heart of downtown Reno and home to the Reno River Festival every spring. With 11 drop pools and dynamic features, this year-round whitewater park offers excitement for kayakers and onlookers alike. 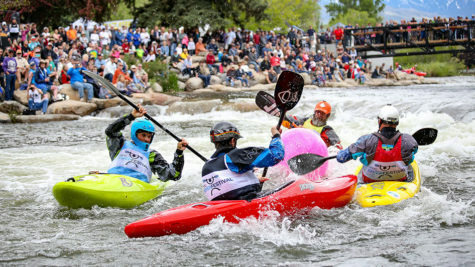 Every May, professional kayakers from around the world flock to Reno and compete in the Reno River Festival. Spectators can watch from the Arlington Street Bridge and the river banks as the kayakers demonstrate their skills and perform front flips, cartwheels and slalom racing. Whether you’ve been kayaking for a while or you’re new to the sport and interested in learning, kayak lessons and clinics are offered by Sierra Adventures, for both river and flat-water kayaking. Depending on your level of experience, Sierra Adventures offers lessons for all levels, from the introduction of gear, paddle strokes and safety precautions, to more advanced skills such as rolls, assisted rescue, open water safety and more. Kayaking the clear, glassy waters of Lake Tahoe is a bucket list item for many water sports enthusiasts, not just kayakers. The ability to quietly paddle into and around hidden coves makes exploring Lake Tahoe in a kayak a very peaceful experience. While you can kayak Lake Tahoe year-round, take special consideration in the winter and spring months when the water is particularly cold. You can find 20 public launch sites along Lake Tahoe’s 72 miles of shoreline. Some of the best places to launch your kayak to see otherwise inaccessible parts of the lake include Sand Harbor at Lake Tahoe Nevada State Park, Zephyr Cove, Kings Beach, and D.L Bliss State Park. There’s no better time to stop and take in the awe-inspiring beauty of the lake than when you are on a kayak, don’t hesitate to take advantage. Sand Harbor and Zephyr Cove offer secluded beaches and stunning rock formations that are great for picnics and quick rests. Or you could take in picturesque views of Carnelian Bay from the point at which California and Nevada meet, so you can be in two places at once! And for an easier jaunt, make your way around to Kings Beach and Incline Village where the north shore offers various launch areas. D.L. Bliss State Park and Rubicon Point are great choices for intermediate paddlers. These areas open up to the brilliant blues, greens and turquoise colors of Meeks Bay and Rubicon Bay that are so often photographed. These inlets provide gorgeous beaches and calm lapping water. Taking the southern route towards Emerald Bay is for more experienced kayakers who will face an undeveloped shoreline but a worth it run. The water may get a little choppy, but if you’re with an experienced guide or friend and want to take on the south shore, you should go for it. For more advanced kayakers who are ready to experience even more of Lake Tahoe, check out the Lake Tahoe Water Trail. This lake trail takes you around the entire 72-mile plus expanse of Lake Tahoe, but it’s broken down into seven segments. Don’t forget to check the Lake Tahoe marine forecast before launch, conditions can always change! Also, before launching in Lake Tahoe, you must make sure your kayak is free from Aquatic Invasive Species or (AIS). There are four Tahoe Boat Inspection Stations in Meyers, Alpine Meadows, Truckee and Spooner Summit that will decontaminate your kayak for free if it has been in contact with an AIS-infected water body. If you want to avoid the hassle altogether, renting is a great option. So, you’re sold on kayaking the entire Reno Tahoe region now, right? We thought so. Luckily, you don’t have to buy a whole setup to test the waters. Renting kayaks in Reno or Lake Tahoe is a breeze. There are many great kayak rental options that help get you, your friends and your family out on the water. From “sit on top” kayaks that place the paddler in an open, shallowly-concave deck above the water to “cockpit style” kayaks where the paddler sits with legs and hips inside the kayak hull with a spray deck or “spray skirt” that creates a water-resistant seal around the waist, kayak rentals are available in every type of flavor, even inflatables. Inflatables are a low-key hybrid of both the sit on top kayaks and the cockpit style kayaks. They sport an open deck, but the paddler will actually sit below the level of the deck. Reno and Lake Tahoe kayak rental companies also have tandem kayaks available as well – made for two and perfect for couples or children. 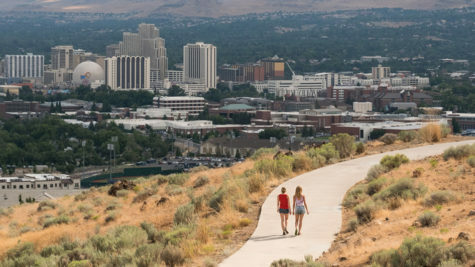 Some of the best places to find kayak rentals in Reno are Sierra Adventures, Marina PaddleFit and Rentals and Sparks Marina Park. 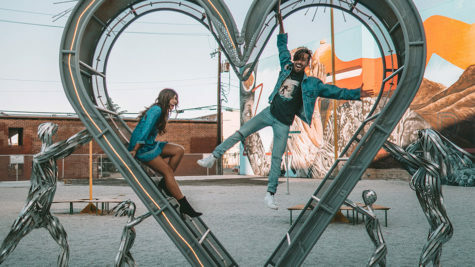 These businesses are close to the Truckee River and Sparks Marina and can offer a breadth of knowledge when it comes to finding the best spots on the Truckee to try your hand at the sport, as well as places that may be too difficult to navigate. While the Truckee River Whitewater Park is a hometown favorite, there are some hidden gems on the river that only some true locals can tell you how to find. Use them as a resource! In Lake Tahoe, you can rent a kayak from Sand Harbor and check out the gorgeous expanse of smooth granite rocks and breathtaking scenery of the east shore. If you’re heading towards the north shore, check out Tahoe Paddle & Oar, Adrift Tahoe, or the Wild Society in Kings Beach. The Wild Society has one of the most unique ways to view Lake Tahoe—a clear kayak. While the clarity of the lake is unlike any other, the clear kayaks from Wild Society help you truly take in the depth of this incredible alpine lake. With an awesome staff, full-service rental shop and quick exchanges, these three board shops will put you out on the lake in no time. These longstanding shops have helped visitors year after year get excited about all kinds of different water sports – it’s time for you to experience the stoke, too! If you’re interested in exploring the waters around the lake, Tahoe Whitewater Tours has been in business for more than 20 years. They offer whitewater rafting on the Truckee from the west shore, kayak rentals and more. The west shore is also home to both Tahoe Adventure Company and Tahoe City Kayak & Paddleboard, too. P.S. Don’t forget to upload your kayaking photos to social media using the hashtag #RenoTahoe for a chance to be featured on the site. Post your pictures to inspire others to get out there, no matter what the season.